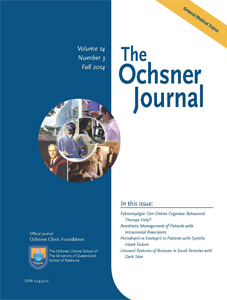 Leading off the fall issue of Ochsner Journal are 6 original research articles covering subjects as diverse as a study of rosacea in dark-skinned women, an analysis of perindopril vs enalapril in patients with heart failure, and a trial exploring the value of using cognitive behavior therapy to treat fibromyalgia. Featured contributor Dr. Robert Reichel provides a comprehensive look at recent advancements in the definition, diagnosis, risk factors, and molecular mechanisms of acute kidney injury. Additional nephrology-themed articles include an examination of chromosomal abnormalities associated with diabetic neuropathy, a review of the pathophysiology and management of calcific uremic arteriolopathy in end stage renal disease, and a procedural for reducing dialysis-related peritonitis. The fall issue features a letter to the editor on the subject of reciprocal healing in healthcare—a call for physicians to go beyond the sole consideration of the mechanisms of disease and to see each patient as a person. The editorial board invites responses to this provocative letter. Also included in the fall issue are the presentation abstracts from Ochsner’s 11th Annual Research Day, as well as overviews of Ochsner research and of the 2014 Research Day events. The complete fall issue is available at the Ochsner Journal website and through PubMed Central. To receive an electronic table of contents for each quarterly issue of Ochsner Journal, please click to complete the form.